Low-noise and low-power extract axial fan with air flow up to 155 m³/h. Continuous or periodic exhaust ventilation of bathroom, showers, kitchens and other residential premises. Modern design and aesthetic look. The casing, impeller and the front panel are made of high-quality and UV-resistant ABS plastic. The aerodynamic design of the impeller ensures high air flow and low noise level. The fan outlet pipe incorporates specially designed air rectifiers to reduce air turbulence, noise level and increase air pressure. The fan is equipped with a specially designed backdraft damper to prevent back flow and heat losses during the fan standby. Ventilation shaft mounting or connection to Ø 100 mm and Ø 125 mm air ducts. The fan is installed directly into the ventilation shaft. Flexible duct connection is recommended in case of the remote ventilation shaft location. The air duct is connected to the fan exhaust flange through a clamp.Fixation to the wall or ceiling with screws. Reliable motor with low energy demand. Designed for continuous operation and requires no maintenance. Equipped with overheating protection.Equipped with ball bearings. Adjustable delay time from 10 seconds to 2 minutes. Humidity sensor activation threshold is adjustable from 60 % to 90 %. The fan is operated via a light switch (not included in the delivery set). By the MCD 60/0.3 electronic control unit. The control unit is supplied separately. By the timer (option). When the fan is turned on by the external switch, the turn-on delay timer is activated for 10 seconds up to 2 minutes. After the external switch is turned off the fan keeps operating for a set turn-off delay time period, adjustable from 2 to 30 minutes. By the timer and the humidity sensor (option). 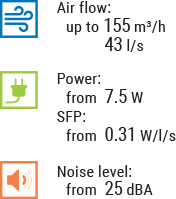 If the humidity level in the room exceeds the set value (60–90 %), the fan switches on automatically after the turn-on delay timer has completed and operates until the humidity level drops to the standard level. Then the fan continues operating within the time period according to the turn-off delay timer setting (from 2 to 30 minutes) and shuts down.